On an island in the Caribbean, a young woman—unnamed and self-described as “unremarkable”—lives a quiet simple life, working for a sailing company and trying to pay her debts. Until a dashing older man, a recent widower and wealthy senator named Max Winter, arrives in town and sweeps her off her feet. After a whirlwind romance, she finds herself newly engaged and ensconced in a life of luxury she never could have imagined. But all is not as it seems at Asherley, Max’s opulent Long Island estate, and no amount of glitz and glamour can keep every secret buried, or every ghost quiet. Inspired by Daphne du Maurier’s Rebecca, and imbued with a rich sense of suspense, Lisa Gabriele’s novel, THE WINTERS (Viking; On Sale: October 16, 2018), is a page-turner about the seductive trappings of wealth, the dangers of infatuation, and the impossibility of escaping the past. Gabriele’s vivid prose brings the affluent Hamptons alive, and skillfully reveals the darkness lurking just beneath the surface and the skeletons in every walk-in closet. Please join me in welcoming author Lisa Gabriele to Thoughts in Progress as she talks about her new release. Welcome, Lisa. The Winters begins like a lot of books, with a handsome man sweeping a young woman off her feet. But at its heart, this is a story about women—our unnamed heroine, plucked out of her quiet existence; Rebekah, the dead first wife who haunts her dreams; and Dani, Rebekah’s vengeful teenage daughter. Did you set out to write a story about female relationships, power, and sexuality? 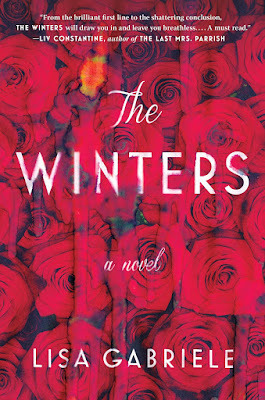 The Winters is inspired in part by Daphne du Maurier’s classic novel, Rebecca—an instant bestseller, first published in 1938, that has never gone out of print, reportedly selling 50,000 copies a year. And it’s obvious you’re a fan. What do you love about it, and what made you use it as the launching point for your novel? Anyone who knows me knows I’m a big fan of Rebecca. My mother, who died almost twenty years ago, introduced me to Alfred Hitchcock’s movie first, and whenever I miss her I reach for it. In the fall of 2016, in the despairing days of the U.S. election, I bought some ice cream and threw in the DVD to drown out the bad news. But this time, instead of comforted, it left me feeling deeply uneasy. I had to remind myself that in Daphne du Maurier’s book Maxim de Winter killed his sexually rebellious first wife, a fact that Hitchcock, due to Production Codes at the time, erased. I suddenly felt this strong desire to avenge Rebecca and punish Maxim. So I guess you could say nostalgia inspired me to reread the book, but anger drove me to write mine. Much of The Winters is set at Asherley, Max Winter’s opulent estate in the Hamptons. Why did you choose that setting? I’ve always been fascinated with Long Island’s moneyed elite; a couple of my favorite books are set there. I loved the storied Gold Coast of The Great Gatsby, and the deceptively serene town in The Amityville Horror. I needed a place that combined history and horror and the Hamptons seemed like a natural choice. However, to pull off the violent conclusion, I also needed a location that wasn’t only private, but remote. In the research stage, I visited the Suffolk County Historical Society in Riverhead and read about Gardiner’s Island. It’s one of the biggest swaths of privately-owned land in America, purchased by Lion Gardiner from the Montaukett Indians in the 1600s, in exchange for a large black dog and some Dutch blankets. Today it’s worth more than $125 million dollars so keeping the island in the family has driven generations of Gardiners to sometimes concoct nefarious plots. So Winter’s Island was born, as was a motive for murder. I changed some geographic details, but the rest of its history and topography, its dense forests, the old ruins, the private beach and thick, marshy shores, are the same. Then there’s the mansion. I love a looming turret, so I made Asherley a Queen Anne Victorian—spookier, in my opinion, than the typical center hall design from the Gilded Age. Entering the house, with its paneled walls, oak and marble floors and mullioned windows, the reader falls back in time. The only modern touch is a dramatic, star-shaped greenhouse, Rebekah’s pride and joy, lodged, incongruously and a little violently, against the house, a constant reminder that this was once her domain. As our narrator spends more time at Asherley and begins to discover her new family’s dark secrets, The Winters becomes a gripping slow-burn thriller. What are your tricks for building suspense and keeping the reader on the edge of their seat? E.L. Doctorow said, “Writing a novel is like driving a car at night. You can only see as far as your headlights, but you can make the whole trip that way.” With The Winters I never set out to “write a thriller.” I just metaphorically made my headlights a little dimmer and the road ahead a little snakier, but kept the speed the same, (barely) avoiding smashing through the guardrails. Also, the whole story is told from one POV. The narrator’s. We are only in her head. We only know what she knows. And she’s fed different versions of the same stories. So who to trust? You can also use short staccato sentences. They ratchet up the tension. Sometimes. Like many fictional politicians—from House of Cards’ Frank Underwood to the Senator in Joyce Carol Oates’ Black Water—Max Winter is powerful, charismatic, and fiercely ambitious. Why did you choose politics for Max’s career, and what made you want to dip into that world? You’ve been a journalist and an award-winning producer, in both radio and TV, for more than twenty years. When (and how) does your journalism background seep into your novels? The Winters takes many of its cues from classic novels—a plain unassuming heroine; a dashing older gentleman; a lavish estate; an inconvenient first wife. But the ending is decidedly more modern—even feminist. Without giving too much away, can you speak to how you went about crafting a contemporary version of these kinds of novels? Writing a modern book that that still pays tribute to a beloved classic is a tricky balancing act. I am a huge fan of the ones done well: Jane Smiley’s King Lear redux, A Thousand Acres, Jean Rhys’ The Wide Sargasso Sea (which is actually a prequel to Jane Eyre, which du Maurier herself retold with Rebecca), Curtis Sittenfeld’s Eligible (a hilarious retelling of Pride and Prejudice), and Joanna Trollope’s Sense and Sensibility. The best ones preserve the original’s landmarks, though the terrain is completely different. They’re written in a contemporary style, though a sharp-eyed reader will spot my own iambic hexameter. And while the characters feel familiar, they’re not facsimiles. No character embodies all of these ideas more than Dani Winter, a 15-year old girl with all the traits of the average Millenial, minus any disadvantages. She has everything a girl her age could want, plus total freedom and the run of the house. She plays with her mother’s clothes and makeup, and the stories she tells about her run completely counter to her father’s. This presents a very current dilemma for our narrator. Does she believe the man she loves or his bratty kid? Dani becomes, then, a reminder that we longer live in an era where stories men tell about women take primacy over the ones they tell about themselves, as the #metoo movement is proving. Women just aren’t having that anymore. I know Dani’s generation isn’t. Finally, considering the evocative setting of The Winters, where do you think is the best place to read a book like this? Lisa, thanks for joining us and sharing this insight into your story. Being a fan of REBECCA, your book sounds intriguing and one that would become a favorite read too. Thanks everyone for stopping by. Are you a fan of REBECCA and if so, do you look for similar books for your TBR list? Whole hearted agreement from here. Women have indeed come a long way (though we still have some distance to travel). Some men (sadly powerful men) have not. What an interesting interview - thanks, both! And it's so interesting to see how one book inspires another like this. I wish you success. That's a really interesting idea for the novel! And of course, Rebecca is a classic - great inspiration. Thanks, both, for an interesting interview! Yes I'm a big fan of Rebecca, especially as it's set in Cornwall, but this sounds an interesting twist with a different location. Definitely one for my TBR list.